[PRICES] Prices vary on each necklace, bracelet and earrings based on the types of materials and beads that are used. 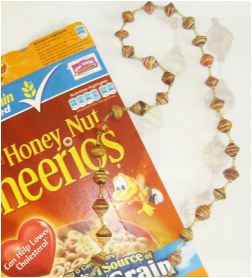 [ABOUT THE JEWELRY] The jewelry is made with different types of beads but a staple of most is actually made from cereal boxes where they are cut into triangle and tightly rolled. They are beautiful and each is a different combination of colors. [PURCHASING] Everything made is one of a kind therefor we cannot promise an exact replica of anything you see in the photos. You can specify color types and approximate lengths (ie: double strand/single strand).